Sales document signing that cuts turnaround time in half. Find out how Docsketch speeds up your sales documents. Sign up with a password instead. Get 40% faster turnaround time and save hours (sometimes days) of waiting. 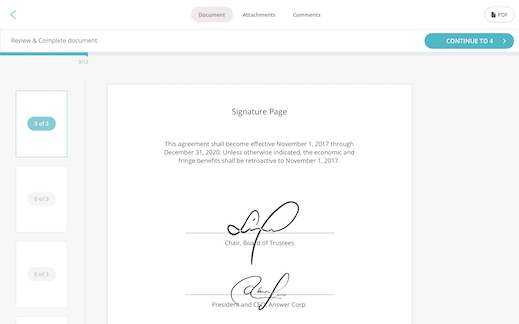 Electronic signatures are built into Docsketch in an intuitive way that’s easy for everyone to use. Avoid the slow and frustrating process of printing, signing, and faxing/emailing back. Docsketch is compliant with U.S. and international e-signature laws. Signed documents are archived and protected from further changes; they're as legally valid as pen-and-paper documents. Know exactly when every one of your sales documents gets viewed. Easily share and track presentations, statements of work, and other read-only documents. Fillable documents like contracts and proposals also automatically get this level of tracking. You'll see your document status on the dashboard and get notified when anything you share gets viewed. Turn any sales document into a template to quickly find it and resend it to anyone. Once you've turned a document into a template, you can access it from anywhere online. For fillable/signable documents, recipients will be guided through the process of completing the document (so you get it back sooner). Tracking documents an also be turned into templates, for easy access and sending without having to dig through email or files on your computer. Some sales documents (like proposals, bids, and estimates) haven't been approved yet. You can enable the "Send as Sales Document" feature to get these types of documents approved. Once recipients are ready for the next step, they click on the "Approve" button and then are guided through completing and signing everything. Document workflows let you choose whether to get everyone to complete your documents at once, or one-by-one in a specific order. When you need people to sign in a specific order, each person automatically gets notified when it's their turn. You'll know exactly who still needs to complete the document, and all recipients will get the completed document once everyone is done. Docsketch will automatically detect blank lines in your documents and helps position your fields in the right place. This makes the process of setting up documents to be filled out, quick and easy. Just drag any field near detected blank lines and Docsketch takes care of the rest. Share, track, and speed up all of your sales documents.